March 12, 2016 March 31, 2018 - by Gold Cochin - 2 Comments. First of all, we would like to say that we are aware that “waterer” is not a correct word but it will do the trick for this article and we know that our readers understand what we mean. Our readers have been using this word in the emails they have been sending to us, so because we couldn’t find a better word to describe this invention, we decided to stay with the word our readers chose. We at the typesofchicken.com team are doing our best to share our ideas, opinions and problem solutions with our fan base. We hope that you enjoy and find useful these ideas for chicken waterers brought to you by the typesofchicken.com team. 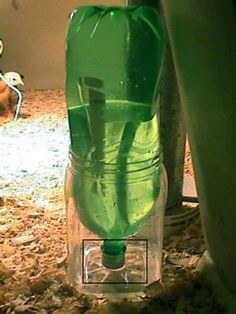 This a very easy to make and simple project and it shouldn’t take more than 1 hour for you to create this chicken waterer. Drill 2 holes close to the bottom of the bucket and opposite from each other, something like 3 or 4 cm above the bottom of the bucket. Then place the bucket in the middle of the foil roasting pan and when you fill the bucket you need to close it airtight as fast as you can! This way when the water comes down in the foil roasting pan and it gets above the holes that are in the bucket, the bucket will be airtight and the water will stop dropping. When your chickens drink enough water and air comes in through the holes in your bucket the water will come down just enough to close that breach. There you go! 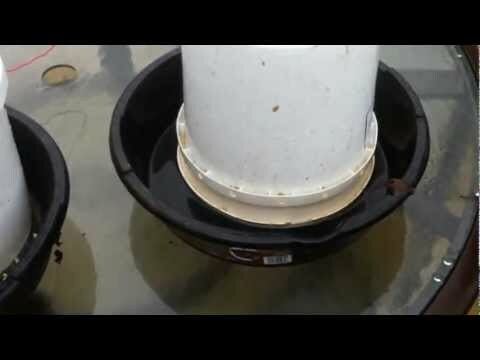 Easy to make and cheap chicken waterer. 2. 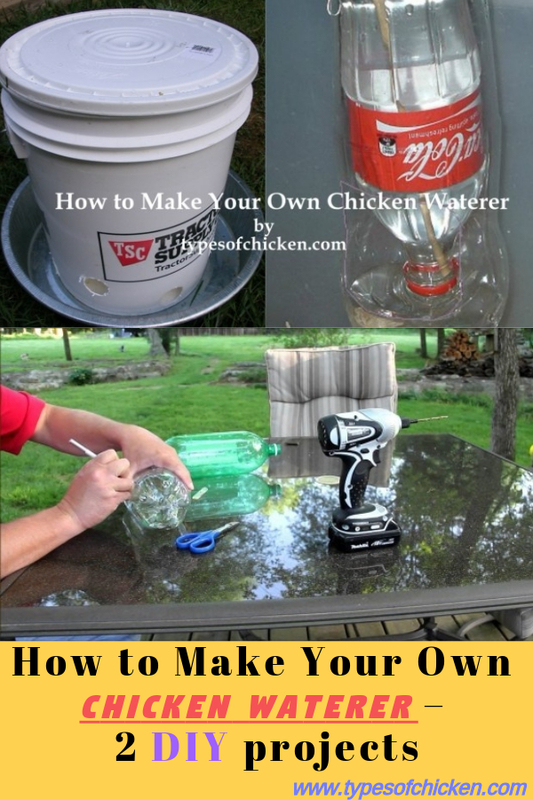 Simpler and Easier to make chicken waterer! You don’t need much to make this, it is much easier than the previous one I will tell you that much. What is different between these two chicken waterers is that the second one can contain less water in it but it can be hanged in your chicken coop and it has a bit more mobility in it. The one above is strictly stuck to the ground unless you start experimenting and you make something out of it than just share it with us in the comment section. Take one of the bottles and cut out the top, then cut out two holes 3 to 5 cm above the bottom(make sure the holes are big enough that the heads of your chickens will fit). Fill the other bottle with water and then fit the one you cut out in the one you didn’t cut out. 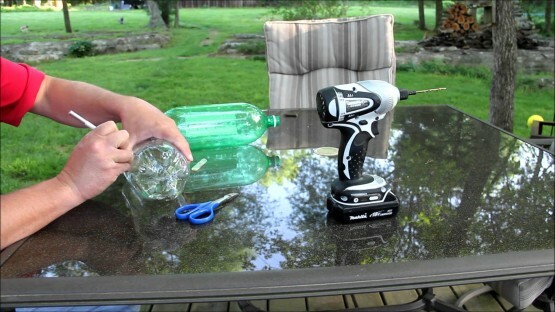 Push it on until the neck of the full bottle is lower than the holes you made on the other bottle. Flip it over and you have your own chicken waterer. Use the duck tape to make a hanger on it and you can hang it in your chicken coop. Previous Article Fertile and infertile eggs: Differences & Similarities? My husband made me a waterer from your instructions on the bucket waterer. It doesn’t work. The water just kept coming out until it ran over the top of the pan and then emptied the bucket. So, what’s the trick? The bucket needs to be airtight after filling, other than the two holes you drill under the level of the pan top.